Two layers of grated potato, onion and herbs stuffed with melted mozzarella and sundried tomatoes make this Pizza Stuffed Potato Rosti just perfect as a main with a side salad, or as a brunch with a nice poached egg nestled on top. I have been wanting to share this Pizza Stuffed Potato Rosti with you guys for so long! It has been a favourite around here for a while now, but I just never seem to get the chance to grab some photos before it is all gobbled up. I got some though, yay! My daughter has totally clicked onto the fact that she has her Nana (my mum) wrapped around her little finger, and that she can elicit all types of snacks from her while she is here visiting from Australia. Today, for example, she convinced my mum to take her for a ‘girls coffee date‘, otherwise known as an outing where Nana buys her yet another cookie and they plot how to ‘not tell mama’. It doesn’t work very well, as she invariably comes home with chocolate smeared all over her face (my daughter, not my mum), and announces that she got a cookie…. I play along and pretend to be horrified, as she seems to get a kick out of it (again, my daughter, not my mum). However, secretly I was very excited for the opportunity to actually get some photos taken this month, so I used the opportunity to whip up some meals and perform the quickest photo shoot known to man. So this dish consists of 2 layers of grated potato, onion and herbs cooked up in a skillet with melted mozzarella and sun-dried tomatoes sandwiched in between. 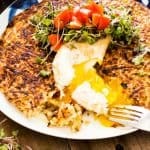 It works great as a main meal with a nice side salad, or as a breakfast/brunch with a nice poached egg nestled on top. If you are a bacon fan, stuff it in there too – it pairs fantastically (just cook it up first)! I hope you love it as much as we do. Oh and if you are looking for other awesome brunch dishes then check out my Garlicky Quinoa and Spinach Brunch Bowl, or my Creamy Barley and Smoked Salmon Brunch Bowl – they are fantastic! Two layers of grated potato, onion and herbs stuffed with melted mozzarella and sundried tomatoes, this dish is perfect as a main with a side salad, or as a brunch with a nice poached egg nestled on top. Have you tried the pizza stuffed potato rosti? I would love to hear what you think – be sure to leave a comment, like on Facebook or pin to Pinterest for later. Happy eating. Its past midnight here and I really want to make me some of that now!! So good! Oh my gosh this looks so good. That egg!! Thanks Tracy 🙂 Yes the egg definitely played along with that photo – sometimes it can be so hard to get them to look as good as they should! Pizza had my undivided attention. It looks delicious and I could make that a meal any time of day. Thank you for sharing. Oh man….could I eat this right now. I am a potato nut….looks awesome!! Oh me too Gloria, I could eat potatoes with every meal! Potatoes and pizza? I did not need to know this recipe existed!! 😉 This looks so good, and a perfect excuse to eat pizza flavors for breakfast. The story of your daughter and her grandmother is adorable. Where has this been all my life! I’m always looking for new potato recipes and this one is truly one I have never heard of. Pizza and potatoes will be a huge hit with my boys. This is what I want for breakfast right here! Brilliant ! Pizza and rosti in one. How brilliant is this? I look forward to trying this. Thanks for the inspiration. Very welcome 🙂 They combine so well! I was sold after reading the words ‘potato’ and ‘pizza’ in the same sentence!